APRIL 1, 1953 – Weeks of preparation paid off last weekend with an all-day celebration of America’s – and Arcata’s – commitment to a weapons-rich future. 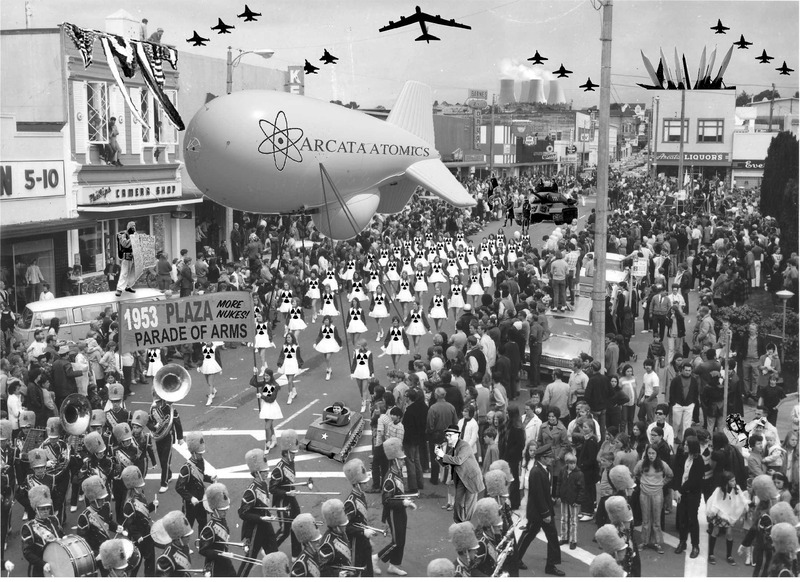 The Plaza Parade of Arms drew thousands to the town square, permanently cementing Arcata’s reputation for all time as a bastion of staunch, pro-military patriotism. As nuclear bombers flew in formation overhead, legions of marchers paraded down H Street brandishing banners and replicas of items in Arcata’s anti-communist arsenal. The event had been weeks in the making, with local schoolkids crafting papier mâché replicas of missiles between duck-and-cover exercises. After the patriotic display, attendees repaired to the Arcata Ball Park for Yellowcake Cake and a dip in the Patriotic Crater Pool. The pool had been filled with water drawn from the cooling pond at the new McKinleyville Nuclear Power Plant. Swimmers emerged from the permanently-warmed waters refreshed and all aglow. This entry was posted on Tuesday, April 9th, 2013 at 8:14 am	and is filed under News, Community, Environment, Technology, History. You can follow any responses to this entry through the RSS 2.0 feed.